Airbus shows off the A380 at the Paris air show. The Airbus A380 super-jumbo has completed its first display flight at the opening day of the Paris air show. Away from the hype, deals have been done at one of the aviation industry's biggest annual get-togethers. Firms are attending from across the globe, with the UK's Rolls-Royce, China Air, US giant Boeing and France's Thales all announcing new agreements. Analysts said they would be watching closely for clues about the health of the industry and its biggest players. The biggest rivalry is between the European firm Airbus and Boeing, and the two firms are embroiled in an escalating trade dispute about state subsidies. Both sides accuse the other of receiving illegal financing for their commercial airline development and have asked the World Trade Organization to rule on the dispute. Airbus has overtaken Boeing as the world's largest maker of commercial aeroplanes and the US firm has made no secret of its displeasure at losing its crown. Boeing's plans to regain the top spot were dealt a further blow on Monday when Qatar Airways said it was choosing Airbus's mid-sized jet over those of its US rival. Qatar said it had decided to buy up to 60 of Airbus's new mid-range A350 jets worth $10.6bn (£5.8bn). However, it also will buy at least 20 of Boeing's larger 777 planes for about $4.6bn. Boeing is having other successes and recently announced a big increase in orders for its new 787 Dreamliner. It is also a bigger player in the military sector of the aviation industry, which is showing increasing signs of health as military spending has recovered from the post-Cold War slump. Rolls-Royce, which has made the engines for the A380, announced it had won a contract worth $800m to supply Air China. Air China will use Rolls-Royce's Trent 700 engine on its new fleet of 20 Airbus A330-200 jets. Meanwhile, Boeing said it would join forces with United Technologies to bid for a US Air Force search and rescue helicopter, according to a report in the Wall Street Journal. The move was expected to be announced on Tuesday, the paper said. And Thales said it would set up a joint venture with Sagem in order to upgrade the Dassault combat aircraft. The deal will exclude the Mirage 2000 and the Rafale, and will see Thales looking after airport radars and communication electronics, with Sagem taking charge of navigation, mission-planning and weapons systems. "Several air forces have already shown interest in this new offering," the firms said in a statement, adding that they wanted the firm to be up and running by the end of this year. Separately, Italian industry minister Claudio Scajola renewed interest in a possible tie-up between Thales and Italy's Finmeccanica, after he said an Italian interest may acquire a stake in the French firm. More deals are expected to be announced during the week of the show. 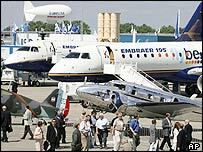 The Paris Air Show is taking place at Le Bourget airport from Monday 13 June to Sunday 19 June, with the public only admitted on the last three days.